Ring in 2019 in the Austrian Alps with AESU! Packing for a Mediterranean yoga retreat is easy. Travelers can throw a few bathing suits and some matching athleisure into a bag and call it a day. Packing for an Expedition in Iceland is another story. With limited luggage space and bulky winter gear, preparing the essentials can quickly turn into a game of suitcase Tetris. Fret not, and discover four simple ways to maximize luggage space this fall and winter! Your long down winter coat is a travel necessity, but it won’t leave much room for anything else in your suitcase. Rather than squeezing it into a sack, wear it onto the plane! Puffy, heavy jackets fit easily into the overhead bin. For long, overnight flights, a warm jacket can double as a neck pillow or comfy blanket. Consider a packable down coat – they’re great for traveling or for everyday use! When it comes to traveling to cold-weather climates, thermals can make or break the experience. You don’t need to pack four wool sweaters to be comfortable. Instead, consider purchasing a pair of thermal underwear. They’re lighter than your average crewneck, and can easily be packed into your checked bag or carry-on. Pro tip: long underwear can also double as pajamas. Shoes can be the most complicated part of packing as it’s often tempting to pack many different pairs until you realize you don’t have any room left in your suitcase for anything else. Rather than packing multiple pairs of shoes, consider bringing a good pair of insulated boots. These will keep your feet warm on the coldest days and can be worn on travel days to allow for more space in your luggage. Consider boots in a neutral color to coordinate with all of your outfits. Regardless of how efficiently you pack, winter clothes are always going to take up a bit more space in your luggage than bathing suits, cover-ups, and flip-flops. This is where some packing hacks can really come in handy. Try using space bags to compress even your thickest sweaters and jackets, maximizing the overall space in your suitcase. Packing cubes are another great way to keep your suitcase orderly, and they can help to ensure you are getting the most efficient use of the space in your bag. The best part about space bags and packing cubes? You can use them for all of your adventures to come! Travel the World with AESU! Experience an exhilarating adventure on the Cosmopolitan, Explorer, Continental tours, and more! 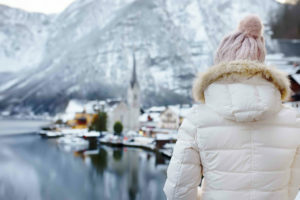 Ring in 2019 in the Austrian Alps with AESU! 2019 tour dates and prices are now available! If you have any questions or want help booking your European adventure, please contact AESU by calling 800-638-7640, or fill out the contact form found on our website! This entry was posted on Wednesday, November 28th, 2018	at 11:22 am	. You can follow any responses to this entry through the RSS 2.0	feed. You can leave a response, or trackback from your own site.